Based on this concert DVD, the Boston Symphony is very fortunate to have landed Andris Nelsons as its next music director. He puts his whole self into conducting these performances, as the results demonstrate. Not since Carlos Kleiber have I seen a conductor who appears to enjoy his role of conductor as much. He really seems to appreciate the talent that this marvellous orchestra provides. Unusually, the concert begins with a piece for only a small portion of the orchestra, Charles Ives’ famous Unanswered Question. The video of this is fascinating, as the spatial requirements for this work are crucial. There are only the four flutes, played here by Philippe Boucly, Natalie Schwaabe, Yu-Mi Kim, and Ivanna Ternay, on the stage. A small string section is located just outside the stage in the foyer, and the trumpeter Hannes Läubin is also offstage presumably behind the orchestra. At any rate when he takes his bow at the end he is standing at the back of the orchestra. The camera-work is very effective and adds a lot to the superb performance. After the Ives, the full orchestra is on stage and a large orchestra it is with all kinds of percussion for John Adams’ Slonimsky’s Earbox. This virtuoso showpiece is almost a concerto for orchestra in one movement with the whole array of percussion getting its due both in the performance and by the camera. Nelsons is obviously having a blast conducting the work, which is in Adams’ best post-minimalist style. It was a stroke of genius, then, to follow Slonimsky’s Earbox with that work’s model, Stravinsky’s Le Chant du rossignol. The only connection the latter has with the New World would seem to be the use by Adams of the Russian work’s beginning to launch his own. Here it sounds like a continuation of Adams with its speed and orchestral colour. However, Le Chant soon takes on the style of The Firebird and even Le Sacre with a good bit of Petrushka thrown in, too. Then there is the Chinese march with the oriental tones of the pentatonic scale. I am not convinced that this is one of Stravinsky’s strongest pieces, but it is still Stravinsky and sounds modern for its time. It may not hang together all that well, but it is memorable if only for the gorgeous solo in the last section. There the trumpet plays the blues and clearly anticipates Gershwin. So that might be another connection with the New World. Dvořák’s connection with the New World is obvious. With the possible exception of Gershwin’s Rhapsody in Blue, Dvořák’s Ninth Symphony may be the most often performed classical work composed in the US. 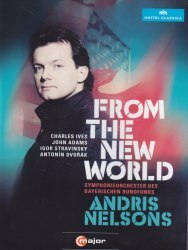 It is played so frequently that it is difficult to make it sound new, but Andris Nelsons and the Bavarian Radio Symphony do just that on this DVD. For the most part, he chooses normal tempos even if his Scherzo is lightning quick. Both there and in the finale, he rushes in places and obscures some of the details apparent in other interpretations. On the other hand, I don’t think I have ever heard the first and second movements played or interpreted more successfully. The virtuoso orchestra is outstanding throughout. Special mention has to be made, though, of the absolutely beautiful cor anglais solo in the Largo. It is not overdone, but is played simply and with eloquence. The musician responsible is not given credit either in the booklet or on the screen, but clearly he should be. A bit of research on the internet indicates that it is Tobias Vogelmann, one of the members of the oboe section. I really enjoyed watching this performance, but could get even greater appreciation just listening on my stereo system. Nelsons is fun to watch, as he is so involved with the orchestra, but after a while he can be a bit distracting. Generally the camera-work is fine throughout and the picture is very clear and present. Michael Cookson reviewed the Blu-Ray version of this concert and found it impressive, but I think the DVD also leaves little to be desired. As to the audio, I compared it with my Harnoncourt/Concertgebouw CD issued in 2000. It is amazing how much clearer, more immediate, and warmer this DVD is than the earlier CD. I am not about to give up Harnoncourt, but I will also come back to Nelsons when I want to hear this symphony. In fact, the whole concert will be worth returning to both as video and audio. The DVD comes with no extras, except four trailers: Andris Nelsons with the Royal Concertgebouw Orchestra at the Lucerne Festival performing Rimsky-Korsakov’s Scheherazade and Beethoven’s Emperor Concerto with Yefim Bronfman; Christian Thielemann and the Vienna Philharmonic doing the complete Beethoven symphonies; a Tutto Verdi box of all the composer’s operas and the Requiem; and the Carlos Kleiber documentary, “I am lost to the world”.